Friends of Friends, an exhibition of contemporary works that use paper as a medium or surface, opened at the GARFO, on February 26. 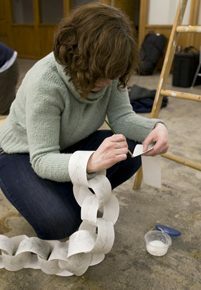 I spoke with participating artist Amber Heaton in early February as she was designing and constructing a paper sculpture to be installed in the exhibition space. Q: Give me an idea of what your installation is about. 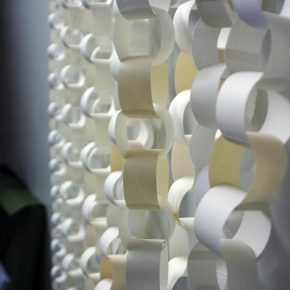 It will be a paper chain – one chain link for everyday I attended school from kindergarten through high school. My attendance record is estimated, accounting for a certain amount of absences per year. Overall the chain will have around 2275 links. They will get progressively bigger through each year, and the type of paper will vary. Q: What is your interface with the gallery/curator? Was there a common theme for this exhibit? Cara Despain and Kenny Riches invited me to participate. The idea of the show is that all the initial artists invite one of their artist friends to also make a piece. It is an exploration of curating. I chose Jared Steffensen. I really wanted to choose an artist who would make a 3-D work, preferably some kind of installation. Q: What is your interface (if any) with other artists who are part of this exhibit? Jared and I are collaborating on our pieces. We are making separate pieces, but they will interact and contribute to each other. He is making a paper [pine] tree installation, and part of my chain will wind around it and [help define the shape]. This was his idea, and I think it is going to be really interesting. I’m also good friends with Claire Taylor and Laura Decker, so we’ve been having art nights where we get together and work on our pieces for the show. This allows us to hang out and have fun, but also be working. Q: How/why did you come up with the idea for this particular piece? After Kenny and Cara asked me to participate in the show, I thought a lot about GARFO as a space. It is housed in an old elementary school that is now an Art Institute for K-12 education. I really wanted that element to be reflected in my piece, and after a bit decided that my piece should be about my personal education as well. I just finished my second bachelor’s degree and will hopefully be going to grad school next year, so it is something that is on my mind a lot. 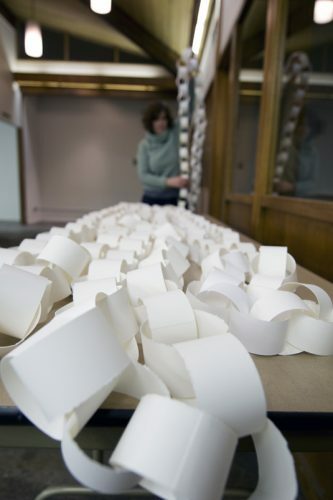 This show specifically focuses on paper as a material, so I came up with making a paper chain — a form most of us make multiple times during our early schooling. 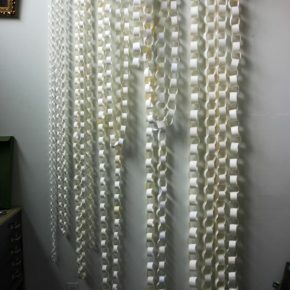 I’m very interested in visual representations of time passing or passed, so I thought it would be exciting to track all the time I’ve actually spent in formal education [K-12] using a paper chain. I think it will surprise me in the end when it is all finished. Q: To what extent does the space lead to the concept (or influence the concept)? The physical space of GARFO will heavily influence the form the chain takes in the end. I know I want the chain to hang from the ceiling and wind through the gallery, but how that looks in the end will be shaped by the physical space. 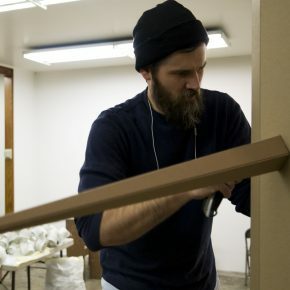 I think this is an important aspect of installation work versus sculpture. Q: What materials are you using for this piece? Why? This is a paper show so of course I’ll use different kinds of paper. I’m using a lot of scraps from other projects but also new sheets. I wanted the type of paper I use to reinforce the size progression of the links from big to small, so the paper progresses from thicker and opaque to thinner and more transparent. 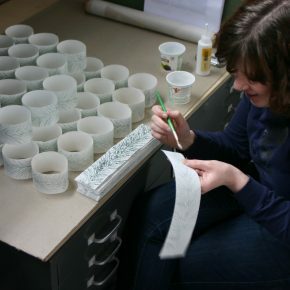 For the section around Jared’s tree, I am letterpress-printing pine needle patterns on strips of handmade paper. I think using these different papers says something about the wide variety of experience of my own education, but also of institutional education in general. In some ways it is very useful, and in others it is very harmful. Q: What are your preliminary steps before starting construction of the piece? I had to decide how big to cut the strips for the links and the rate of progression from big to small. The strips start at .25 x 3 inches and progress .25 inches in width and 1 inch in length per year.|1 – 2| I also had to research laws about school attendance in Utah, which my friend Jay Heuman helped with one night. After that I started cutting the strips. Luckily we have a great guillotine cutter at my work so cutting took less time. A lot of the thinner papers, like the Japanese tissue, have to be cut by hand though. Q: What are the steps during the construction phase (off site and on site)? Off Site – Cut down the strips of paper to make the links. Then, glue the strips into links and chains. Luckily people have been volunteering to help with this part once in awhile because it’s fun. I’m going to give helpers part of the chain afterward if they want it. I’ll have to glue the thin Japanese papers by myself because they are a lot more difficult to handle, especially the tissue. On Site – Hang and assemble the chain. For now I’m keeping each year separate for ease of construction and transport. I’ll link the years together during the install. Q: Is there a “life after GARFO” for this piece of art? 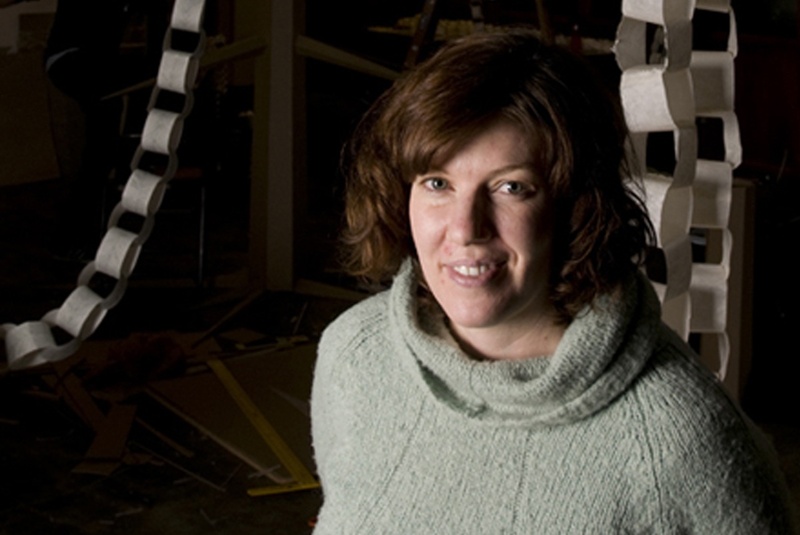 Can you disassemble, store, and take it elsewhere? Conceptually it was really built for this space, but I think the idea could translate in another gallery space. It can definitely be disassembled and stored. I will probably reuse the paper in the larger links for other projects. And I’ll offer to give anyone who helped during the construction part of the chain. Q: How much time do you expect to spend on this piece of art? Q: How do installation artists make money from this type of art (or is that not an issue)? I guess eventually you might get commissioned and paid to make an installation somewhere. Some installations will break into salable parts, like my show at Kayo in July with the deep sea animal prints. I sold some work there. I guess it just depends on the situation and on the piece. I don’t think there is a giant market for installations owned by private collectors, but making them can influence people to buy other work you make. For me installations are more a great way to express an idea in a visually larger way and in physical space. Also, I like thinking about the conceptual and metaphorical space in which a piece will be housed. Every space has a life and history and memories. It is interesting to let those things influence the work. It’s a different kind of creative process than making a piece that has no connection with where it is hung other than it is displayed there. For me that is one of the draws of installation work. The installation of this piece was very frustrating for me. Over two installation sessions I hung and combined all the sections of the chains except for the part that would interact with Jared’s tree. I was feeling really weird about my piece at this point. It was spread through the gallery, hanging from a lot of the ceiling beams. It looked very discordant and festively silly, like party decorations or Christmas. Jared and I met the next day and hung the sections of the chain on his tree. We tried it three different ways until we found one we were basically ok with. When we were finished, I left the gallery feeling horrible about my piece. I was done with the install, but I thought it looked really bad. When I got a message from Kenny and Cara that it would be all right with them if I changed it, I took the chance. I went back that night and took down all the sections of the chain except the part on Jared’s tree. I reconfigured them into a wall shape in the center of the space. When the chain was consolidated into one area it looked a lot more substantial. The progression of size and variety was much more apparent. When I finished, I felt a lot better about the piece. Kenny, Cara, Laura Decker and Claire Taylor were a big help to me during this night of installation. They gave me a lot of good suggestions and physical help. 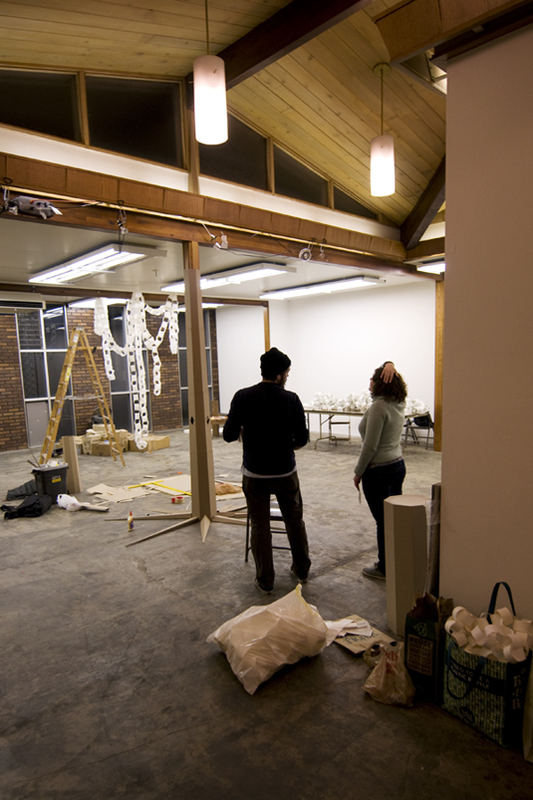 Also, watching Cara and Kenny’s curatorial process is truly amazing. Their insight, decision-making and problem-solving are totally in sync with each other. They also work their asses off. It was like watching the dynamic duo. I left the gallery that night feeling pretty good. Friends of Friends, an exhibition featuring 20 local, national, and international artists that surveys contemporary art using paper as a medium and/or surface continues through April 23, at GARFO.